After an auspicious beginning as a royal land grant from French king Louis XV to a wealthy French citizen of New Orleans in 1763, the land Michoud Assembly Facility occupies remained in private ownership until 1940, when it was sold to the US government. Prior to World War II, the site was used to grow sugar, hunt muskrat, and build railroad and telephone lines. In 1941, the world's largest industrial site was built, covering 43 acres of unobstructed, low-humidity, air-cooled space under one roof to construct C-46 cargo planes. The Korean War required the assembly of Sherman and Patton tanks there, while the space race compelled the design and assembly of the colossal Saturn I, IB, and V rocket boosters for the Apollo program that reported directly to Dr. Wernher von Braun. The 1970s saw the fabrication of the enormous external tank for the Space Shuttle program. 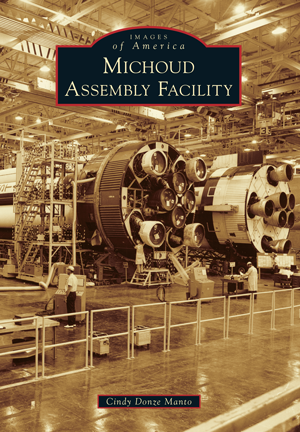 Today, Michoud Assembly Facility continues to support the US space program by building major components for the Orion Multi-Purpose Crew Vehicle (or MPCV). Cindy Donze Manto, a historian and urban planner, has assembled a compilation of photographic images, maps, and memorabilia culled from a diverse array of libraries, museums, private collections, and NASA.